Disclosure: The Enchantmints Ballet Class Musical Treasure Box was provided for me in order to facilitate my review. All opinions are my own and honest. I am disclosing this in accordance to FTC Guidelines. Please see “Disclose” tab for more information. What little girl doesn’t love having a beautiful Musical Treasure Box? I can promise that with the Enchantmints Ballet Class Musical Treasure Box that your child will be completely satisfied. For well-being, the developing child requires Goodness, Beauty, and Truth. Their mission is to embody these ideals by creating imaginative products that provide joy for children and parents alike. This wonderful treasure box is excellent for tiny treasures. This musical treasure box has a hinged top, inside compartment, twirling ballerina figuring, and a lovely velvet-flocked paper lining. Earrings, bracelets, charms, and sachets are all safe and comfortable inside any of the four drawers: one on the front, one on the back, and two on the sides. We were incredibly excited about this wonderful little Treasure Box. My daughters have greatly enjoyed finding jewelry, and other little treasures to fill up the box with. They absolutely love the “secret compartments” that are included in the wonderful little treasure box. My daughters also greatly enjoy playing the music and watching the ballerina dance. If you are interested in purchasing this great Treasure Box or one of the other wonderful treasure boxes that Enchantmint has to offer, head on over to their website and find exactly what you are looking for. 1 Lucky winner will receive an Enchantmints Ballet Class Musical Treasure Box. This giveaway is open to U.S. residents only. The giveaway ends 8/5. Thanks for the giveaway! I am excited. I hope I win the prize. I love the fairy collection treasure tower. I love the Dragon’s World lunchbox! So cute! I love the rose cottage one! Visited the site and I really like the TINY BOXES: Mythical Creatures Sleeping Bunny box, its so adorable and perfect for my niece. I love the Pegasus Treasure box it is beautiful and Pegasus is my favorite mythical character. Thanks for the giveaway! I am excited. I hope I win the prize. I love the mirror collections. my granddaughter would love the star one. thanks for the contest. I like the story time puzzles, jack and the beanstalk looks fun to read. Oh I also really love the Baseball Treasure Boxes! So cute! They really have such adorable things! I hope I win! I really like the Horse in the Meadow foldaway mirror. Thanks for the giveaway! I am excited. I hope I win the prize. I also love the Fairy Treasure Tower! How Adorable!! Thanks for the giveaway! I am excited. I hope I win the prize. I love the Under the Sea snapbox. 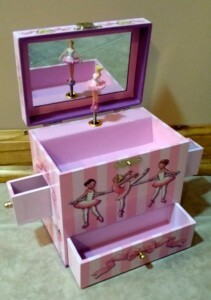 I love the ballerina lunch box! My niece has been asking for a music box, and this one is wonderful! Thanks for the giveaway! I am excited. I hope I win the prize. I like the Rose Cottage snapbox. Thanks for the giveaway! I am excited. I hope I win the prize. I like the Beneath The Waves Treasure Box. My daughter would love this prize. Thank you for the awesome giveaway. I really like the Tooth Fairy boxes. Thanks for the giveaway! I am excited. I hope I win the prize. I like the TREASURE BOXES: The Horse Collection. Thanks for the giveaway! I am excited. I hope I win the prize. My daughter would love the Thumbelina book. She is a big reader and is always wanting books. Plus this is a great story. Wow! I love the music boxes, but I think my daughter would really like the single Fairy in a Box- Fairy Village! Oh..I love the princesses of the world one too. How cute! Thanks for the giveaway! I am excited. I hope I win the prize. My goddaughter would love this. 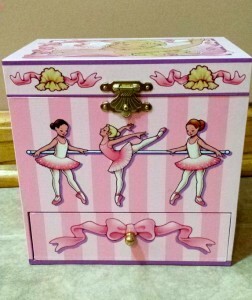 My daughter would love the Carousel Treasure Box from Enchantmints! Thanks for the giveaway! I am excited. I hope I win the prize!!!! !